A typed card sent by Gunner George Pickering to his father in Woodston, Peterborough, probably sent in late 1943 or early 1944. 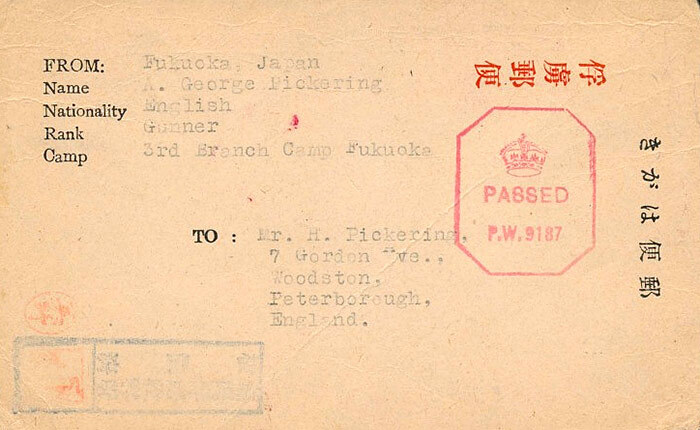 It has a rectangular boxed japanese censor mark in blue (bottom left) with seven characters to the right reading Fukuoka Furyo Shuyosho or Fukuoka Prisoner of War Camp and the three to the right reading Ken’etsuzumi (Censored). Across the top right in red is preprinted Furyo Yubin (Prisoner of War Post) and five further characters in black on the right side, Yubin Hagaki (“Postcard”). It has a UK PASSED PW 9187 octagonal censor mark in red. 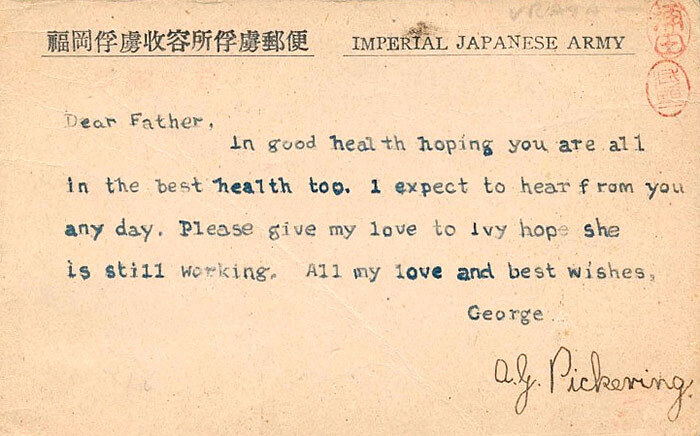 The message side is preprinted with eleven japanese characters being Fukuoka Furyo Shuyosho Furyo Yubin (Fukuoka Prisoner of War Camp Prisoner of War Post) and IMPERIAL ]APANESE ARMY in English.